Websites for Homeschoolers…or for Anyone! I’m not sure if I’ve ever technically been considered a homeschooler, but I do know that even before my kids were born, I never intended for them to wait until they got to school to start learning. Their entire short lives (they’re 4 and 6), I’ve stocked up on educational supplies, created lesson plans, and scoured the internet for craft ideas. We’ve made countless trips to museums and zoos, attended story time, and sought out just about every educational opportunity at our disposal. 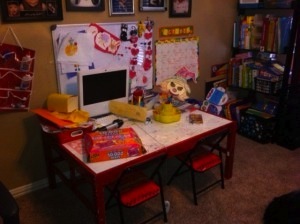 Long ago, I also turned our office into a “classroom”—so maybe I am a homeschooler at heart! Now that my son is in kindergarten full-time, and my daughter is in preschool part-time, I don’t need to put so much thought into planning out educational activities for them. But I don’t think I’m capable of leaving everything in the hands of their teachers – it’s just in my nature! I like to be involved as much as possible, which also includes volunteering at their schools whenever I can. So from time to time, I still hit my favorite homeschooling-type websites for ideas on lessons, activities, crafts, and other ideas for fun things to do with my kids. Check these out – I guarantee you’ll be inspired! I like to have as much of a role in my kids’ education as I can. Much of the time, education comes in the simple form of fun. My kids won’t be little forever, and I want to fill up our time with as many enriching activities as possible to create a lifetime love of learning! My daughter with autism has 27 teachers, aides, therapists and bus drivers who interact with her on a daily basis. My son has 16 teachers from school, church and various activities. 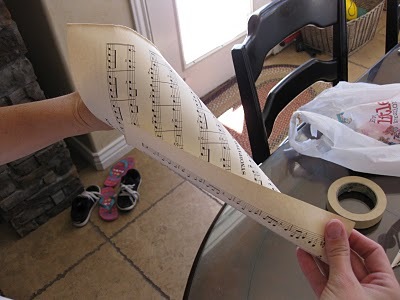 With Christmas around the corner, I’m trying to think of creative ways to stretchy my giving dollars so that everyone feels the appreciation they truly deserve. 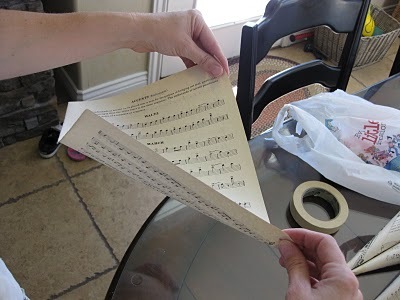 Last week, I caught my dad chucking a bunch of old sheet music; his mother was a piano teacher and church organist. I snatched the weighty stack out of the recycle bin. “What are you going to do with these?” he asked. “I’ll think of something,” I said with a slight shrug. Here’s the something thanks to google and the design guru behind the blog “Primp,” I have inspiration! Behold!! 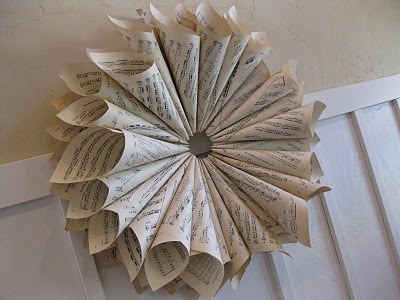 I thought a vintage sheet music wreath would be a perfect addition to my evolving piano room. 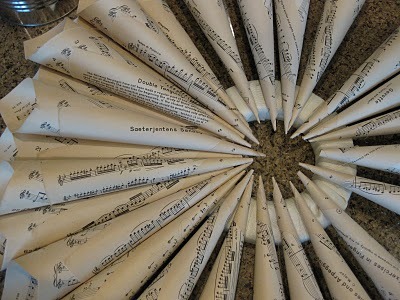 This one turned out similar to my first book page wreath. 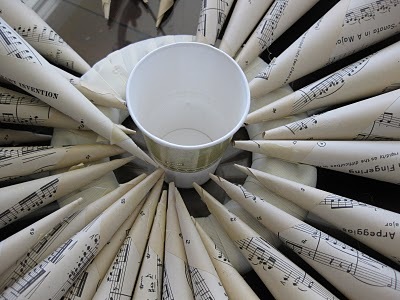 It was a very fun and addicting project, made with supplies purchased from either the dollar or thrift store. Total cost= $5! I just cut it right in half with a knife. 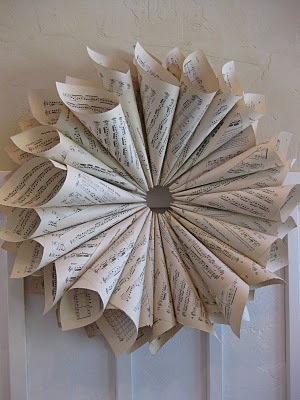 If you buy a thick one like me, just save the other half for when you want to make another book page wreath. Trust me you will–they’re addicting. 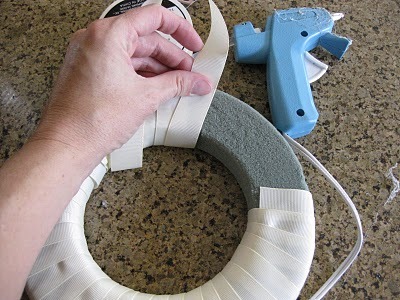 Wrap the wreath with a wide ribbon, glueing occasionally as you go. Or you could skip this whole step, especially if your wreath is white or cream. 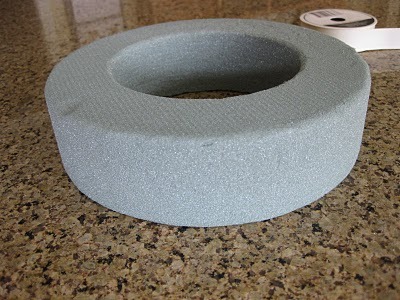 This one was made out of florist foam and flaked every time I touched it so I definitely wanted to wrap it. 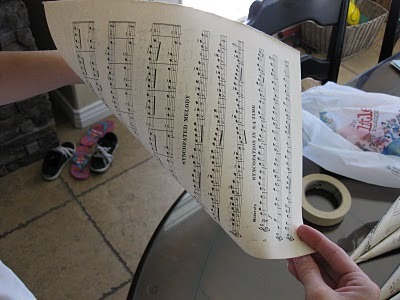 Now tear out about 50 pages of vintage sheet music. This is where it gets really fun. 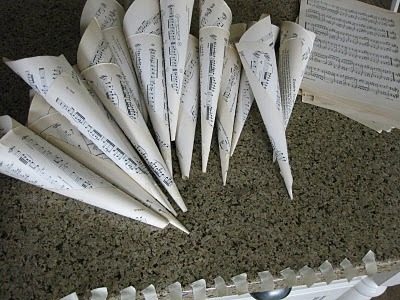 Once you get the idea of how to form each sheet into a cone shape it goes really quick. 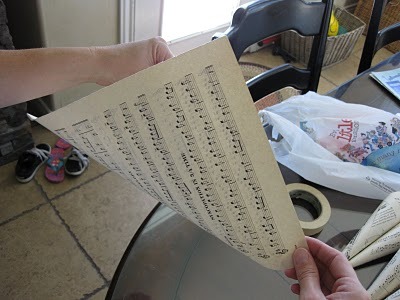 Take a sheet and place your fingers on the two corners on the long side of the paper. Keep your left hand still and with only your right hand wrap that corner around. Continue to wrap in a forward motion. 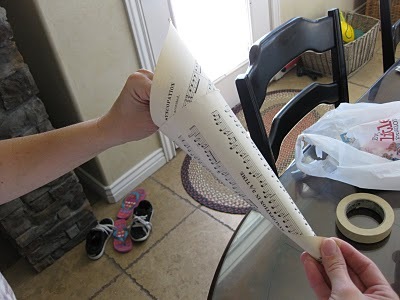 Now twist your left and right hands in opposite directions to tighten the cone. 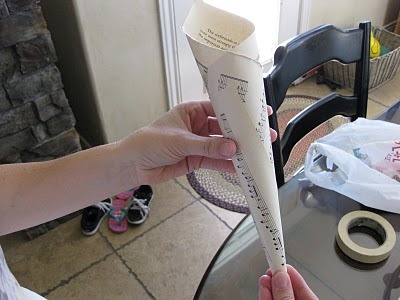 You can twist a lot to make a skinnier cone or twist less and leave the cone opening bigger. 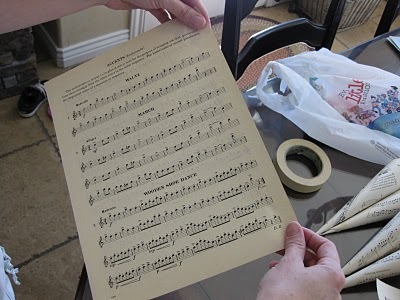 Then secure with a small piece of masking tape. I used a combination of skinny and big ones. 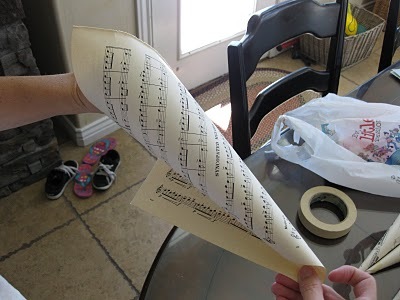 Once you have a big pile of these you are ready to glue. Put your cup right in the middle. 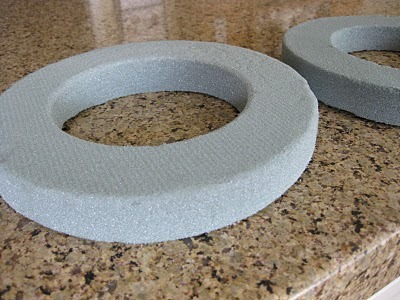 This will help you get a nice size circle opening in the center. You can vary the cup size depending on how big or small you want the opening to be. Go all around the wreath hot gluing a single layer of cones to the wreath form. Don’t worry if there are spaces or if it doesn’t look perfect, this layer will be covered up. Continue with a second layer. 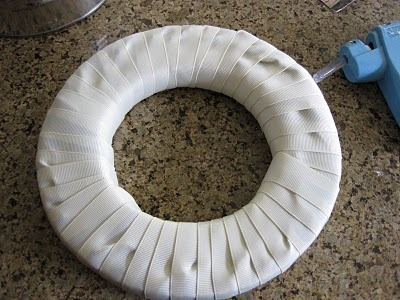 Hang using a piece of ribbon or fabric threaded around the back of the wreath form. Right now my wreath hangs simply from a small nail but I envision it one day hanging in the middle of a shabby door or gate hung just above the piano. 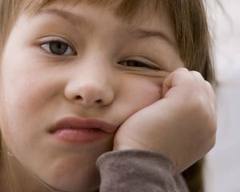 A couple weeks ago, Lori wrote a great blog about Boredom Busters (click here to read it). I loved it – I always enjoy peeking inside another mom’s head to see what cool ideas they use to keep their kids entertained. I wanted to expand on Lori’s list a little bit, and encourage everyone to throw in their two cents. Summer is the time when all of us need a hand in filling the long days! 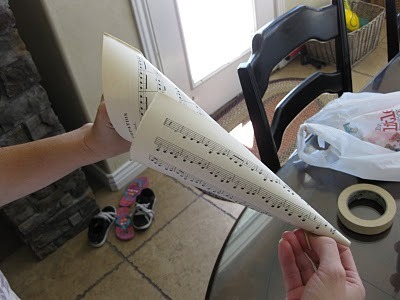 What are some creative, free OR inexpensive things you do with your kids? Here’s my list. I think I’m going to print it out and let my kids pick one every day until we’ve done them all! A friend of a friend told me about this simple craft about a year ago. It’s been on my list of things to do and I never got around to it until recently. With the weather hitting the high 90s, the crayons my kids left in the car were no match for the heat. They melted all over the inside of a pencil box we keep in the car. Sometimes it takes an act of Nature to motivate me! I then put the tray in the oven set to 400 degrees for about 5-10 minutes. You’ll know when it’s ready because all of the big chunks will be completely liquefied. Once the crayons are completely in liquid form, I cooled them for about 5 minutes. I then stuck the entire tray in the freezer. It took about 20 minutes to freeze them. Once they are frozen, you can remove them from the freezer and pop them out of the tins. Leave them on the counter a few minutes and they’ll go back to room temperature. *One useful tip is to try and fill the tins as high as you can. If they aren’t filled, the crayons will be thin and will break easily when the kids color with them. 2 pm, Saturday, June 4 at River Legacy Living Science Center. Discover the habits and adaptations of one of our native animals. FREE. RSVP to 817.860.6752. The Mask in the Moonlight! 11 am, Wednesday, June 8 at River Legacy Living Science Center. Watch a story performance about a raccoon who teams up with a famous cowboy to outwit a gang of ruffians. Stay afterward for a discussion with a Naturalist and additional family activities. Presented in partnership with the Arlington Public Library. FREE. RSVP to 817.860.6752. 2 pm, Saturday, June 11 at River Legacy Living Science Center. Explore the nature trails surrounding the Science Center on a family-friendly guided nature walk. FREE. RSVP to 817.860.6752. 11 am, Saturday, June 18 at River Legacy Living Science Center. Hear a fun, seasonal story presented by an Arlington librarian and participate in a craft or activity afterward. FREE. RSVP to 817.860.6752. For more information, visit www.riverlegacy.org. Bring the kids to Lakeshore Learning Store in Dallas on Saturday, April 16, from 11 am to 3 pm for a fun Earth Day celebration! Decorate a kids’ tote bag, plant a flower to grow at home, and play with products inspired by nature – and it’s all FREE! Lakeshore Learning Store is located at 13846 N. Dallas Parkway in Dallas. For more information, or to score some store coupons, visit their website at www.lakeshorelearning.com.